The Bradley Outdoor Patio 3-piece Wood Bar Set is designed to be maintenance free. Every piece is carefully Finished with a beautiful, multi-coated and weather-resistant paint that will not fade due to over exposure in the sun. It will maintain its new look from the first day and for years to come. Made from 100% Acacia Hardwood that is native to Australia and Asia, and used in the construction to make excellent and high quality furniture that resists mold, mildew, fungi, termites, rot, and decay. Comes in beautiful White Painted Finish, this set will bring your outdoor patio a classic charming look, sounds perfect! This stylish, space saving buffet server with cooler compartment offers many uses and provides multi-season durability. It features a wide counter space that stands up to high heat and spills, a raise-up lid that covers the cooler section and left and right side drawers that store cocktail napkins, bottle stoppers, table mats, silverware, and other dining essentials. Two roomy cabinets hold more than you can imagine, a middle upper compartment stores a small to mid-sized cooler, and the lower storage area is ideal for glassware. Crafted of solid wood harvested from the Cypress tree family, with decay resistance similar to Western Red Cedar, ensures sustained beauty for many seasons. Turn your backyard into the most popular spot in town with the Margaritaville Surfboard Bar. Made of Poplar wood with a quality Sherwin-Williams paint finish. It comes with stainless steel hardware and the roof is PVC plastic simulated tin Corrugated panels all weather proof with Land-shark Sign attached. The bar includes menu chalkboard and directional signs with shelving behind the bar. 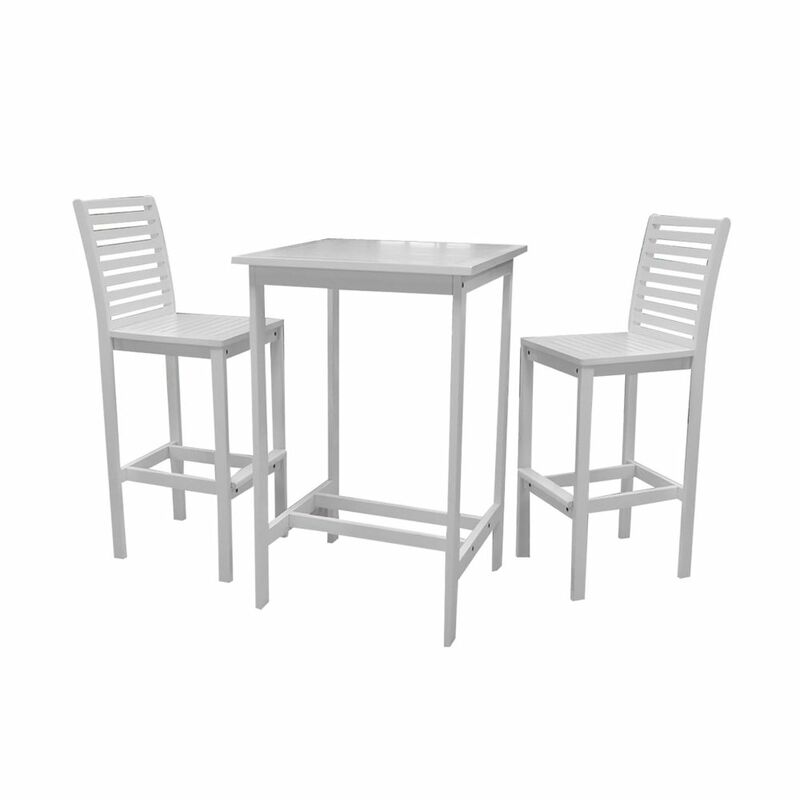 Bradley Square 3-Piece Wood Bistro Patio Set The Bradley Outdoor Patio 3-piece Wood Bar Set is designed to be maintenance free. Every piece is carefully Finished with a beautiful, multi-coated and weather-resistant paint that will not fade due to over exposure in the sun. It will maintain its new look from the first day and for years to come. Made from 100% Acacia Hardwood that is native to Australia and Asia, and used in the construction to make excellent and high quality furniture that resists mold, mildew, fungi, termites, rot, and decay. Comes in beautiful White Painted Finish, this set will bring your outdoor patio a classic charming look, sounds perfect!